"I'm a kind-soul time traveler with a camera in one hand and a carry-on in the other." • I was born into a military family in New York. Too short and without perfect eyesight for the military, it turned out to be my "gift." • At a very young age, I was inspired by my father, now a professional photographer, who currently exhibits his work internationally. By the time I was 12, after following him around for a year or two, I entered a few competitions and was surprisingly recognized by numerous organizations. including the prestigious Long Island Camera Club and the Camera Club of New York. • While earning a degree in Neuropsychology and Biology, I decided to enter the business world for 30 years before finally diving full time into my creative side. During those years, I owned and operated a national video game company that employed over 25 and distributed products throughout the U.S., Canada and the Caribbean. As you can imagine, I was my son's ... and his classmates best friend! • My artistic passions were put on hold to pursue my medical and business endeavors. Finally, after 30 years, I laid down my pen and picked up my first digital camera. It was a world of discovery and a chance to travel and see the world in an entirely new way. 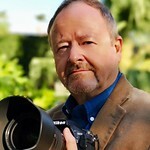 • I've had the opportunity to work with some of the most talented photographers and photojournalists in the world. Studying under such artists as Trey Ratcliff and Serge Ramelli, I've been able to hone my artistic skills, allowing me to focus on capturing and presenting images from around the world in my unique style. • I recently represented the city of Hollywood, Florida, hosting a one man, three month public art exhibition in their City Hall. My work is currently being represented by numerous galleries in the U.S. as well as private collections. In addition, many of my images are featured online by official organizations in Greece, Italy, Ireland, France, Peru and Spain. • Lots more to cover, including my YouTube tutorials, workshops, tips and techniques and training events, but more on that later. Between all the social platforms (FB, Insta, Pinterest, YouTube, Twitter, 500px and YouPic), I receive thousands of views and followers everyday and I love my internet friends. • What makes me do this and share my art with the world? I think it's about creating emotion. I want to bring you into my world and share my vision. We made a point of getting to the Louvre bright and early so we could spend a good amount of the day taking in the sights. One thing about the Louvre is that it's not only large, but it's incredibly complex to get around. It's like those videos where you walk up a set of stairs and seem to wind up on the same floor. Don't ask me to explain, but for those who have toured this museum, I know you feel my pain. Despite having a map in hand, I was constantly asking for directions and still found myself getting lost. On a good note, I did get to see more stunning art than I could have asked for and was lucky enough to have an afternoon date with Mona Lisa. 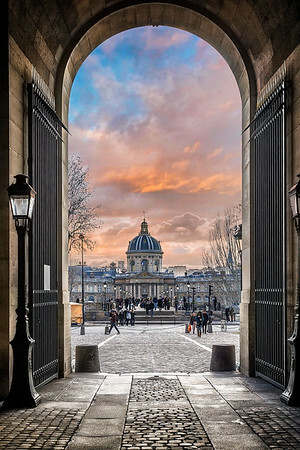 Here's an afternoon view of The Palais Institut de France, taken from the exit gates of the Louvre.